I thought I'd try kind of a tutorial today, I'll give it a go, its for festive nail art but with a twist... Which you've probably already seen from the title... That its festive minions! So hopefully this is quite a quick and easy little tutorial for you! 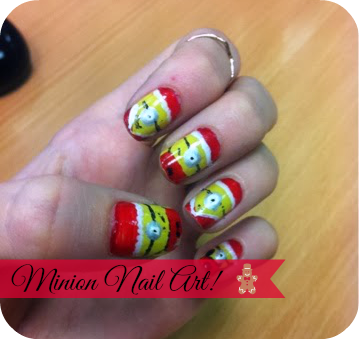 Two of my favourite things, Christmas + Minions = Festive Minion Nail Art obviously... haha. I've tried to keep it very affordable also, after buying all the Christmas presents this is a nice treat to yourself! Also sorry about the awful photos, again this winter lighting is making things rather difficult and the picture of my awful looking hand had to be taken in quite a rush at college! Sorry! Oh and don't forget a base coat and a top coat too! Step 1: Apply your chosen base coat and then follow with two coats of Barry M Lemon Ice Cream. Step 2: Once the yellow has completely dried, paint on a block of red at the bottom of your nail and at the cuticle end of your nail. Make sure to leave enough room for your minions features in the middle though! 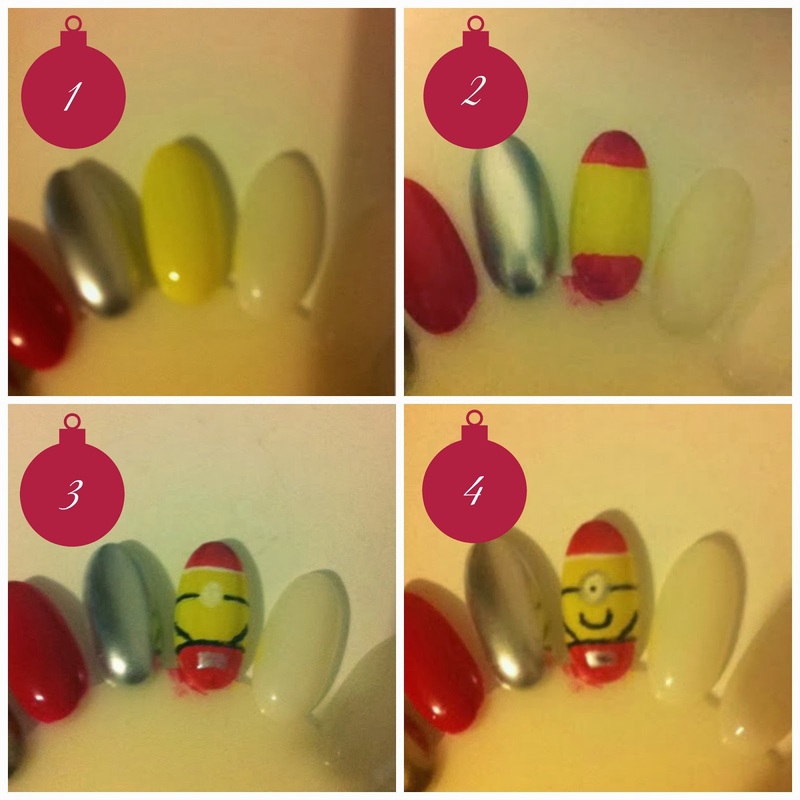 Step 3: Take the White Barry M Nail Art Pen, Once both the blocks of red have dried and draw a line over where the red block at the cuticle meets the yellow. That's your Santa hat done! Put a big white dot in the centre but top of the yellow in the centre of your nail. You might need to go over it again too so it stands out! 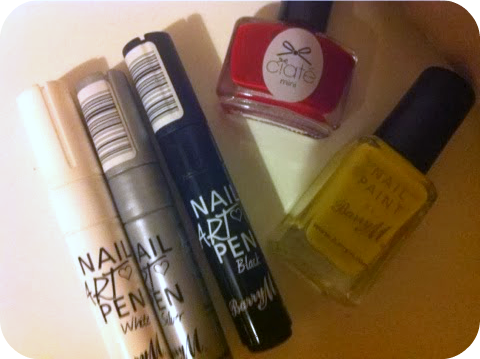 Then take your Black Barry M Nail Art Pen and draw a line where the yellow meets the red on your other block of red. put two diagonal lines going from this to either sides of your finger to make little straps for the uniform. Then draw two lines from your White dot for his eyeball and take them to either sides of your finger! Step 4: To finish him off, put a little black dot in the centre of the white, Then take your Barry M Silver Nail Art Pen and draw round the white dot to create his glasses rim, Also draw a little rectangle for his belt buckle. Then finally once the belt buckle is dry, add a even tinier square of black in the centre of the silver! Add a swipe of your top coat to seal the little design in place and there you go! Minion Nails all ready for Christmas! I hope this isn't too confusing and that you like it! Let me know if you do!